Immediately lock all doors in your prison. Lockdown is an Emergency command that the player can use to maintain order in their prison. Its primary function is to immediately lock all Doors in your prison, which can prevent the spreading of Riots, or to halt Prisoners from trying to escape. Additionally, if a Riot does occur in your prison, then a good strategy to employ would be to immediately activate the Bangup Emergency Action and send all willing prisoners back to their cells to minimize the force of the riot. Use Lockdown afterwards to prevent rioting prisoners from getting too close to the entrances of the prison. Keep in mind that prisoners who are unable to reach their destination due to a Lockdown will be unable to satisfy their Needs and will slowly become irritated and angry. Use Lockdown only if you feel that a riot is about to begin. Once the player hits the Lockdown button, all doors will instantly close and lock, including doors in Unlocked Sectors. As seen in the upper right-side image, the doors display the same icons as if they were individually locked with the "Door Mode: Locked Shut" setting. Clicking on a Guard and forcing him to go through the door by right clicking anywhere beyond the door. This will tell the guard to use his keys to open the door briefly. During this brief period, anyone can pass through the door. Right clicking on a door in Lockdown will force it to stay unlocked until the player right clicks on the door again. This can be used to direct guard and staff traffic in the event of a riot. However, if a prisoner has access to keys, they will be able unlock doors in lockdown and attempt to escape without the player's authorization. In order to prevent an escape from happening, the player must use the "Door Mode: Locked Shut" setting on each entrance door. The one problem players will face is that the door will stay closed until it is set back to normal, or is destroyed by the prisoners. 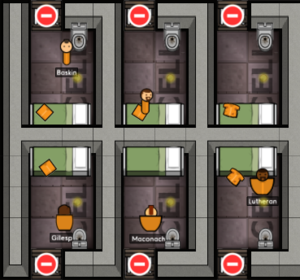 Prisoners are able to smash down locked down doors without keys. Just like other emergency actions, Lockdown can be turned off at any time at the command of the player.